This week I made my first sales trip for my new consulting company. I returned to Knoxville where I had my old company ACS for 10 years and paid a visit to several old customers and friends. If you have read through many of the articles on this site you have seen references to NAS, or Nalle Automation Systems. Back in 1996 when I started my company one of my earliest customers was Bertelkamp Automation. They are a distributor of motion control, pneumatic and aluminum extrusion as well as various other control components. When I started out I was only about a block away from Bertelkamp and used to build control panels and do small integration jobs for them and their customers. One day when I was in their front office I met Tom Nalle. He had recently left his job at International Paper and started his own company. We got to talking and it turned out he was in need of some controls help, he had been using a guy who still worked for IP and couldn’t devote the time required to his projects. The first job we worked on together was a marker packaging machine which I referenced here in a previous story. Before we knew it NAS had hired several more employees and so had I to keep up with all of the work. To make it easier I moved my company next door to NAS’s facility and subleased part of the building. We cut doors in the wall and operated as NAS de-facto controls department until about 2000. During this time we did a lot more than packaging; we were the largest vision integrator in Tennessee for a while and built a lot of inspection, assembly and material handling equipment. I hadn’t talked to Tom Nalle, the owner of NAS since I closed my company and moved to Nashville in 2006. This week, along with visiting some old friends at Bertelkamp and Keisler, I had lunch with Tom and his operations manager Sam and toured their facility. They now build only standard packaging equipment and infeeds and their products have evolved quite a bit over the years. Where they (and ACS) used to build almost everything out of aluminum extrusion, their baggers and sleeve wrappers are now much more robust and built on a stout tube steel frame. NAS has had a patent on a low temperature seal blade for a number of years and their business has grown substantially. NAS has retained most of their original employees and has now been around for 16 years. It was like returning home to see all those old faces from my past! As I mentioned in a previous post, networking is the key to my sales efforts for my new company. When talking to Tom and Sam over lunch Tom said his sales efforts have been substantially based on that also. Most of his sales come from references from people who like his equipment rather than standard marketing advertisements. Of course nowadays you have to have a web presence, but most contacts come through word-of-mouth. What a great trip! And it actually ended up bearing fruit immediately as I picked up a small job from Keisler while I was out there. 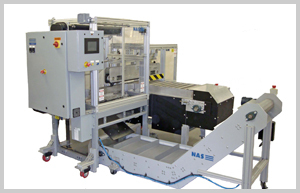 I would encourage anyone looking for quality packaging solutions to contact my friends at Nalle Automation from the link above or giving them a call at 865-777-9477. Tell them Frank sent ya! As far as I know, pneumatic is one of the lessons learned during the first vocational high school. This is a lesson that can make the machine work according to the user own control. Perhaps this is the basis of knowledge which is used in a packaging machine. Takiing a trip specifically to see the process of packing machines is good for your comapany. You’ll be getting experience there. *** Note from Frank: Thanks for posting your link in the correct forum for your company. As I mentioned in a previous comment with a link to their company information, I often don’t approve comments that are simply advertising their company, however if the content is related to the subject it is posted under I don’t mind so much. Pneumatics are indeed an important part of packaging machinery, and visiting a manufacturer is a great way to learn different automation techniques. Thanks for the comment!